Vijayan is a school teacher but his heart isn’t in teaching. He longs for the carefree days of his youth, roaming around town without a care in the world, basking in the company of friends and classmates, spending his father’s money on movies, alcohol and jaunts. Those days are long gone since he now has a wife Shyamala and two daughters to support. But every once in a while, he sneaks away from his day job to play hooky with his buddies, indulging in drinking/gossiping sessions, causing his family much consternation. “Is this how a grown man behaves? Utterly irresponsible! He steps out to buy a can of coconut oil and is gone for seven days! No one knows where the man is!” and so on. The father and father-in-law rack their collective brains and hit on a great plan. Let’s send the guy on a pilgrimage to Sabarimala. Now Sabarimala is not an easy trip. It requires dedication, focus, discipline, abstinence. After much resistance, Vijayan gives in and begins the 40-day routine. He gets through it without much fuss and proceeds to Sabarimala. Thousands of devotees making their way to the temple, subsisting on meagre food and rations, braving sleepless nights of discomfort and overcrowding, getting a momentary glimpse of the deity… Vijayan is touched to the core. He returns home a changed man. His beard grows longer and thicker, he dresses in black/white/saffron, makes 2-hour trips to the temple each morning, dispenses flowers and fruits to the devout few thronging his house. And delivers religious sermons to the students at school. Family is baffled. The plan wasn’t all that genius, after all. It backfired, and so bad. When the elders confront Vijayan, he retorts – Isn’t this what you guys wanted? Now I am a devotee, I don’t drink alcohol or eat meat, I am engrossed in thoughts of the Divine. What is your problem? No answers. Family finances are dwindling, everyone is worried. One day, Vijayan runs away, leaving behind a note – I cannot take this any more. I am leaving. Don’t expect me to return. Shyamala is distraught, the elders are distressed. Well, you gotta do what you got to do. Shyamala gets an old sewing machine, rounds up a small clientele, begins her life anew. And she gets busy, managing her little enterprise, and two darling daughters. Forsaking your loved ones and causing them pain is not Sanyaasa, Vijayan learns. Neither is shirking one’s responsibility. Vijayan is restless, plagued by guilt. He gets into a fight with another Ashram inmate, finally decides to leave. He returns home only to find that Shyamala is a busy woman, running a successful enterprise. She gives him the cold shoulder, acts as if he doesn’t exist. He meets his father and father-in-law who make no bones about their anger and disappointment. His friends are happy to see him back but they cannot help him break the ice with his family. Finally Vijayan gives up, breaks down. Shyamala’s heart melts, she accepts the prodigal son into her life… all is well. 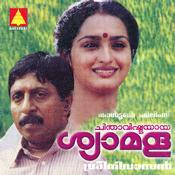 Chinthavishtayaaya Shyaamala is one of my favorite movies. Tight script, excellent performances, great dialogues and a superb message. A spiritual seeker is not one who runs away from responsibility or forsakes his/her duties. Sanyaasa has NOT a thing to do with an individual’s external circumstance; it is an internal attitude. Cultivating a Sanyaasin’s attitude is something even a householder can do. It is simply the practice of Vairaagya, dispassion. Like King Janaka or Lord Rama or Krishna. What I adore about this movie is that this immensely profound message is delivered with much fun, humor and lightness. No heavy “hit-me-over-the-head” seriousness or preaching. Now that’s what I call a fantastic movie.